SaddleBack Equestrian’s summer camps are for ages 7 & up with emphasis on safe horsemanship, sportsmanship, and showmanship. Campers ride in daily lessons on one of SaddleBack’s safe and experienced school horse. They also get a realistic introduction into the daily routine of caring for horses, horse-mounted games, a fun horse show, and education materials including their own camp notebook. SaddleBack's qualified trainers lead camps to ensure each camper receives excellent riding lesson instruction. Beginner Camps – For those just starting out with horses OR with limited experience. Campers will learn to steer, halt, walk, trot, post, and 2-point (jump position). Those with limited riding experience will work on more advanced skills to help them camp. Campers will learn to groom and tack up the horse, and basic horse care. Farrier & Vet Demos possible. Advanced Beginner Camp – For those walking/trotting AND for those walking, trotting and cantering in hunt seat lesson program. Campers will be introduced to cantering if not yet cantering, and jumping if ready and already cantering in current lesson program. 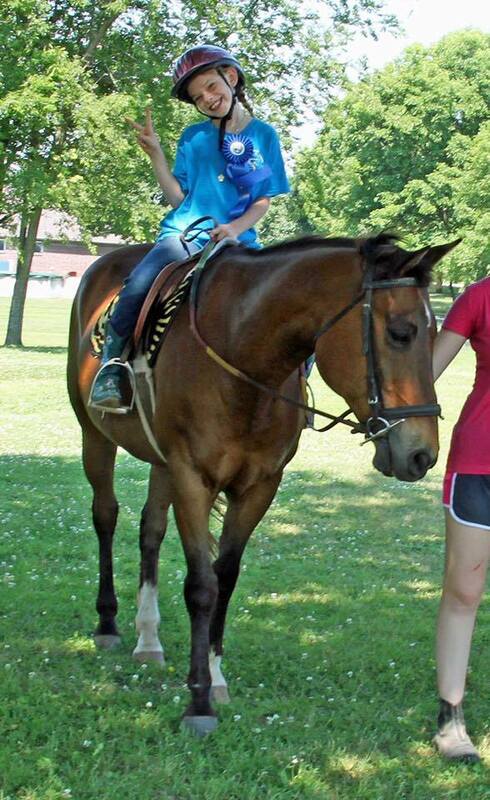 Campers will enhance their riding skills at all gaits and do polework. They will learn basic horse management including horse care, vet & farrier care, feeding and more. Camp slots are limited and fill quickly. Sign-up online through secure PayPal to guarantee your spot and/or mail in deposit with Registration Form! SaddleBack Equestrian’s Spring Break Camp is for riders ages 7 & up, either just starting out with horses OR those with riding experience--campers will be split up for group lessons based on their riding experience (new to horses group, already riding group). Campers ride in daily lessons on one of SaddleBack’s safe and experienced school horse, along with learning how to care for horses, play horse-mounted games, and more! SaddleBack's highly qualified trainers lead all camps to ensure that each camper receives excellent riding lesson instruction & horsemanship. Lindsey Banks has over 15 years experience teaching riders of all ages. She has shown Grand Prix level jumpers and won numerous year end awards including the 1.25 m jumpers. Her students have won the Horsemanship Challenge for USHJA Zone 7, and she’s also taken riders to medal finals! While specializing in hunters, jumpers, and equitation, Lindsey believes a foundation in dressage is important for horses and riders. Lindsey has studied riding under George H. Morris and was selected to participate in the 2014 Gladstone Program. Lindsey believes in continuing education and makes an effort to attend riding clinics with instructors such as: Ann Kursinki, Bernie Traurig, Julie Winkle, Pie Lafferty, and Laurie Hedlund,. Sign-up today as spaces are limited per group. Contact for pricing. Horses available if needed.